How do you like to exercise? Some like a fitness class with the socialization and direction it provides. Others like a more solitary pursuit. Some are more flexible in their approach while others have a firm schedule they follow. Regardless of how you do it, it’s important to remember to exercise. There’s a wealth of information on the impact of exercise on our minds and memories as well as the obvious impact it has on our overall wellness. Those with a variety of neurological diseases and impairments find exercise increases strength, improves endurance, and minimizes symptoms. Individuals with memory concerns find it can improve overall memory as well as physical function as they age. There’s really no reason to delay, it’s time to make exercise a priority in our lives starting now! When we remember to exercise we assist our bodies and minds to age as well as possible. The sooner we do it and make it a daily habit, the better we’ll feel and function now and in the future. Get outside! Often exercising outside doesn’t feel like exercise, more like fun! Make it a habit. Go for a walk every morning or evening, join a regular class, schedule it into your calendar-whatever you need to do to make it a habit. Use what’s available. We don’t need special equipment to exercise-walk, do strength exercises with soup cans or your own body weight, or swim at the local pool. Get cleared and if necessary, seek professional help. If you have any medical or health issues, get the okay from your doctor to begin a new exercise regimen. If you haven’t exercised in a while or just want to have a professional get you started, seek help from a physical therapist or licensed trainer. It’ll get you started off well on your exercise habit! Listen to your body. As expected, new exercises will make us sore as we use our muscles in different ways. But extreme or continued pain, inflammation or weakness are signs to rest and/or see your doctor if not improved with rest. 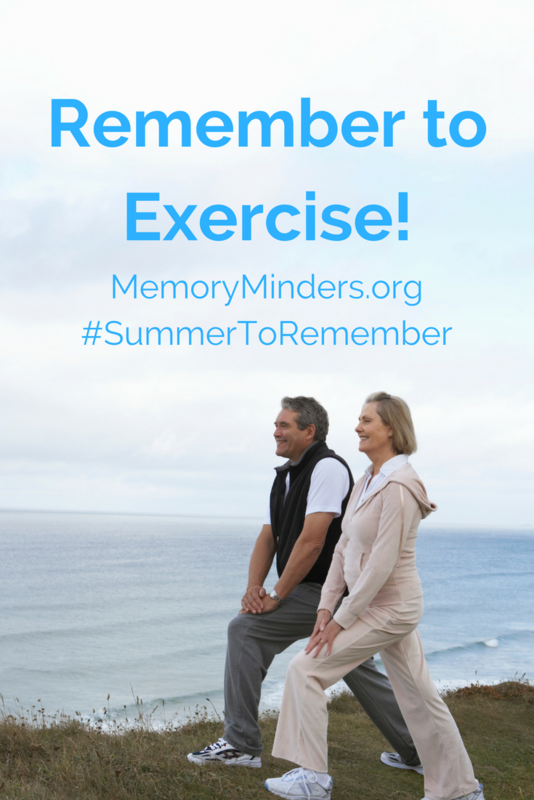 Let’s remember to exercise our bodies this #SummerToRemember. It will help our bodies, our brains, our memory and all those summer memories we’re making! Life is made up of choices. One after the other, every day, all day, we make choices whether we realize it or not. Not doing something is also a choice. We either choose TO DO or NOT to do something. Either way it’s a choice. All these decisions can be overwhelming and daunting, especially as we age. Our choices matter, so how do we choose wisely? By keeping what’s important in perspective. If we want to make wise choices for our memory and brain, we need to keep what we value in perspective. What’s important to you as you age? Is it a healthy body, mind, and spirit? Are your relationships important, your work, faith, and/or your legacy? What we deem important is where we focus. To make wise choices, we need to keep what we value at the heart of all of them. Making choices involve many different parts of our brain, particularly the frontal lobe. Decisions can become more difficult due to our aging brains but also from our daily lifestyle choices. Making memories, remembering what we want to when we want to, and making decisions can all be made a bit easier by how we live. Our everyday choices have an impact on our memory and overall brain wellness. Maybe it’s because I’m seeing children turn into adults in front of my eyes or watching loved ones and clients age, but I want all my choices to reflect what matters most. I want to remember well and want those I care for to remember well too. Life is short, so let’s make our choices count. Let’s create an environment to make memories in all our fleeting moments. Summer memories are often some of our most treasured. Our choices, whether made quickly or after thoughtful deliberation stitch together the fabric of our memories. So let’s choose to start here, today and this summer. Let’s make this a Summer to Remember by consciously choosing what’s important to us and for us. To dive into making this a Summer to Remember, we must understand our lifestyle choices made multiple times daily impact our overall and also our memory wellness. Choosing wisely includes managing what and how we think, what we eat, how much we move our bodies, and understanding how to focus and use our memory well. These and other topics will be the focus of our blog for the summer. To begin, let’s all take a moment in the next week to identify what’s truly important and the memories we’d like to create this summer and in the future. Write down what’s important to you and make a list of memories you’d like to create. This may take planning either to initiate or to get ourselves ready to make a memory. Choices stem from what we value, so let’s identify what’s valuable for each of us. 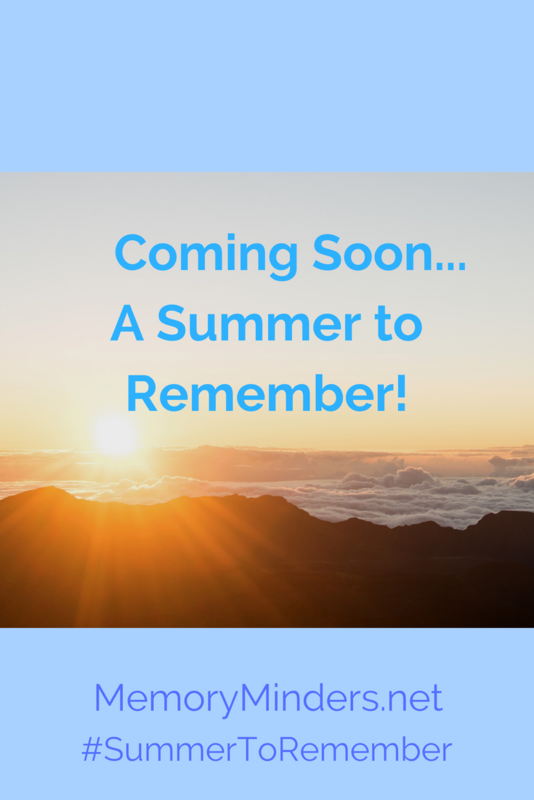 Beginning next week, we’ll dig into a new topic impacting our memory wellness each week to truly put ourselves in the best position to make this a Summer to Remember! Join me on social media by sharing what you value and want you’d like to capture this summer by using the hashtag #SummerToRemember. Let’s focus on what’s important and dive into a Summer to Remember! It’s almost here, can you feel it? Maybe it’s something we aren’t happy about…the impending loss of a loved one, or an unwanted life change. Or maybe it’s new and exciting…a wedding, graduation, or move into the future we’ve been anticipating and planning. Often the waiting and build up can be full of worry, eagerness, and frustration, but one thing life always brings is memories. How to make and keep memories in each of these anticipated moments can be lost in the experience itself. Often big events can happen so fast or are so full of emotion we miss making memories in the moment. Let’s not miss these memories, because it’s these little and big moments of life that make each of us unique. Even if all you’re anticipating is a relaxing summer, let’s not miss any of our upcoming memorable moments. Let’s instead make it a Summer to Remember! On the blog this summer, we’ll discuss all those moments that may be coming (or even some that may have already passed) and how to remember them well. It will truly be a Summer to Remember! We are all at different stages of life. Some of us have aging parents or spouses, growing and busy children, or both! But we all have aging brains and memories, too. It’s my goal to encourage all of us, no matter our stage of life, to capture and remember our moments well. But I would love your help, too! What bothers you the most about your or a loved one’s memory? What additional resources could you use to make it a summer to remember? What memory encouragement do you wish for? Any other ideas on how we can assist you in making your moments memorable? Life is full of moments. Some are mundane and routine. But even in the small moments of life, we can garner nuggets of memories. Even more important are the big, anticipated moments we want to hold onto. I look forward to sharing some simple strategies and encouragement in the next few months to cause us all to make it a summer to remember. Please chime in here with a comment or reply, on Twitter, or Facebook with how we can make it most beneficial for you. Let’s grab hold of all our memories, make them truly memorable and a #SummerToRemember! Turning the calendar to April always feels a bit like a new beginning. It’s the fourth month but in many ways, it feels like a fresh start. Spring is coming and April heralds its brilliance beautifully. New life sprouts from the earth, brighter colors flood the landscape, and animals are birthed in the fresh breezes of April. 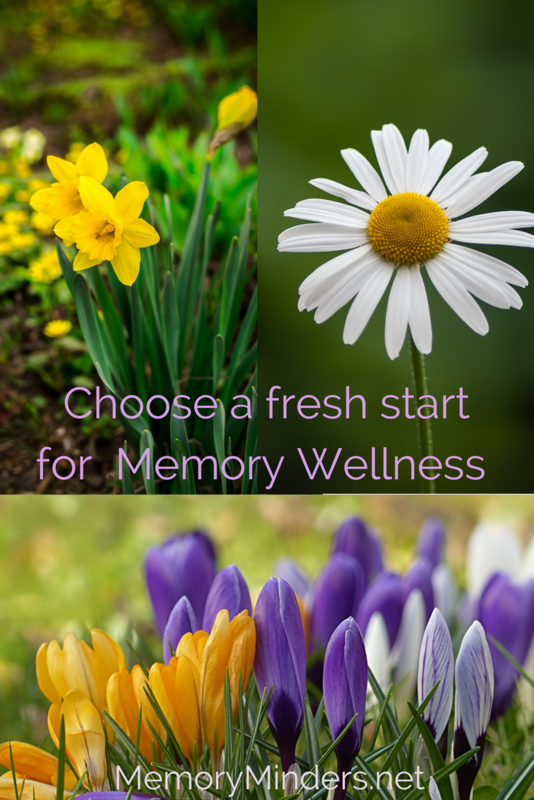 It’s also a great time to start anew on our memory wellness choices. Let’s honor and begin this new month with a fresh perspective on how we approach our memory. What are you doing today to positively impact your memory in ten, twenty or thirty years? It’s not something we think of each morning, but we should. What we do today determines how well we’ll remember in our later years. Makes you think, doesn’t it? So let’s begin this month by consciously choosing to improve and enhance our memory and overall wellness by what we do each day. These choices don’t have to be big, but they will add up to a huge impact over time. Our lifestyle choices are like compound interest for our wellness. Going to work? Park further away, take the stairs, walk at lunch and/or move each hour to insert more exercise into your day. Eating today? Add or swap in some colorful, brain healthy foods to assist your memory and overall wellness. Feeling Stressed? Step back from the situation to get a better perspective. Shift your attitude and manage the stress to avoid chronic illnesses and the brain limiting effects it can create. Feeling Sluggish? Get up and exercise both mind and body as well as taking steps toward good quality and quantity of sleep each night. Can’t remember like you used to? Stop and ask yourself if you’re doing too much or not enough. Doing too much distracts and steals our focus which hampers memory. Not doing enough mentally or physically leads to atrophy of brain cells which doesn’t allow the brain to access memories successfully. Organize and prioritize your time to remember well. All of us can benefit from a fresh start for our memories and there’s no better time as we begin a new month and season. Every choice we make matters in this life. 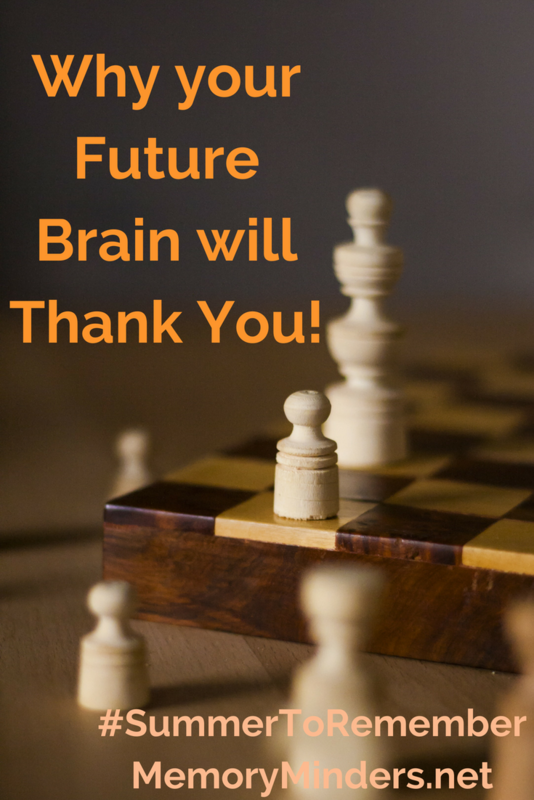 Are we making choices that will help or hamper our memory in the future? 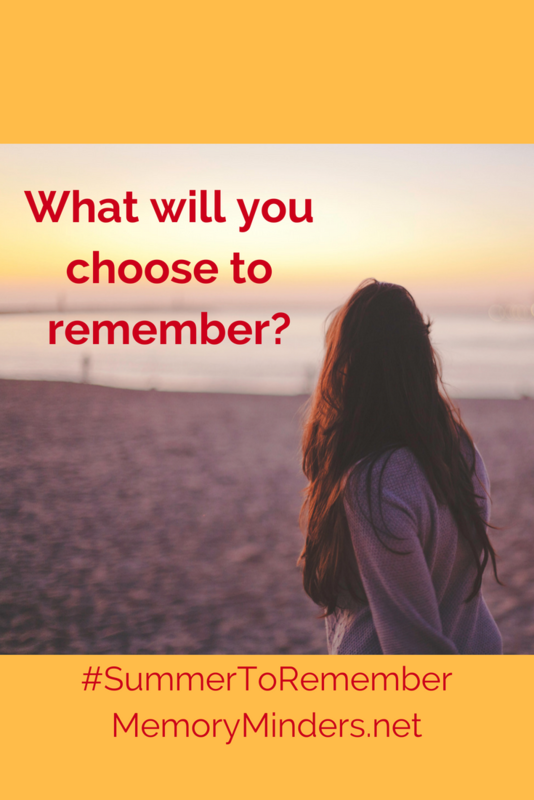 The choice is ours; let’s choose well and make a fresh start for our memory today!